Shaspo Tours representative will pick you up from your hotel in Aswan, transfer by air-conditioned van to your Nile Cruise, Embarkation before Lunch, enjoy an excursion to visit The High Dam, Unfinished Obelisk and Philae Temple, Lunch on board your Nile Cruise, dinner & overnight in Aswan. Breakfast on board, start to sail in the morning to Kom Ombo, pay a visit to Kom Ombo Temple, sail to Edfu, lunch included on board your Nile Cruise, visit Edfu Temple dedicated to God Horus, then sail to Luxor, Dinner & overnight on board your Nile Cruise. 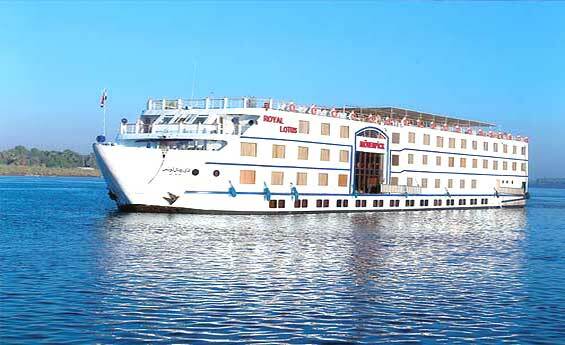 Breakfast on board your Nile Cruise, enjoy an excursion to the West bank, visit Valley of the Kings including visits to three tombs only, then proceed to visit Hatshepsut Temple at El-Deir El-Bahary, finally visit Colossi of Memnon, lunch included on board your Nile Cruise, dinner & overnight in Luxor. Breakfast on board your Dinner Cruise, disembarkation after breakfast, enjoy an excursion to visit Karnak & Luxor Temples, at the end of your tour transfer by air-conditioned modern van back to your hotel in Aswan. Prices per person per night quoted in US dollars.